The ASC 12/4 Solar Regulator is a solid state device that will prevent overcharging of lead acid and gel batteries, while using its designed charge control process. 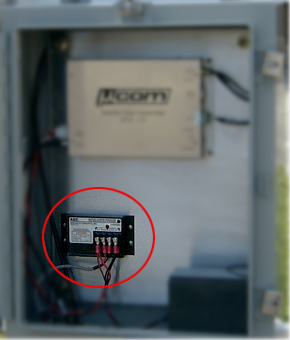 The unit will not present any significant parasitic loading on the battery system. The electronics are housed in an anodized aluminum chassis and encapsulated in a hard epoxy resin for maximum environmental protection. The terminal block accepts up to 12-gauge wire or a space connector, providing for a simple installation. This unit has a temperature compensation feature, which responds to changing temperature by producing a variable DC output voltage. This will optimize the recharging rate for any given battery temperature and is of primary importance in cool climates. A blocking diode is incorporated in this design and a charging light (LED) indicates when voltage is being passed to the battery. Dimensions: 6" x 2.5" x 1.25"